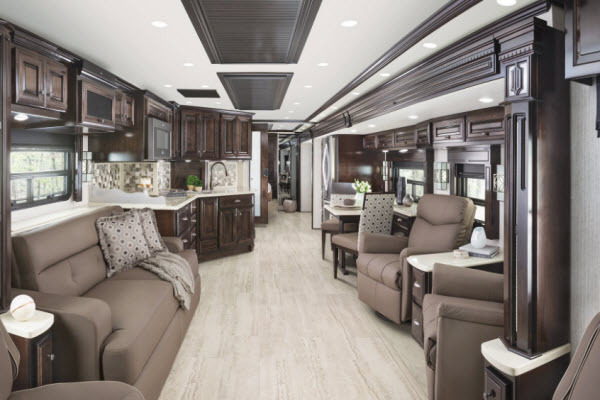 What puts an RV on the list: Since space is really the name of the game here, we’ve hand picked the motorhomes that feature at least 3 slide outs per floorplan and brands which have at least 4 such floorplans so you get enough variety to choose your pick. 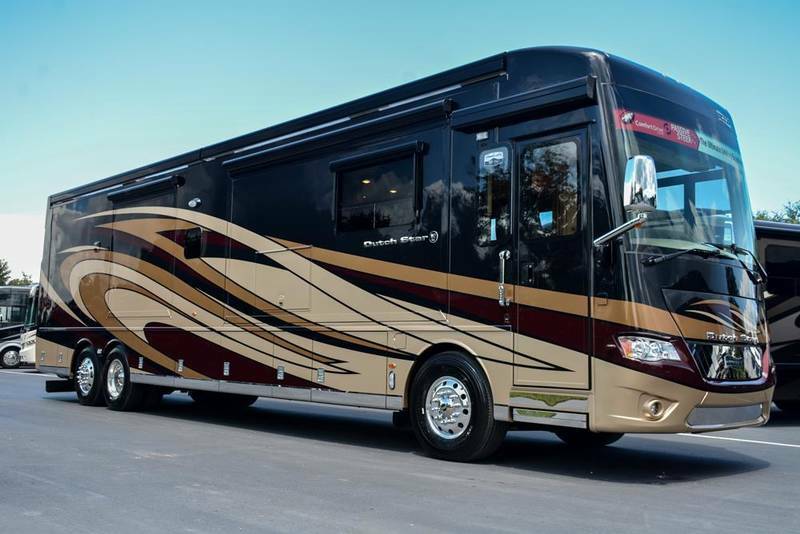 It goes without saying that these RVs are also highly respected among the critics and has secured many happy campers over the years! 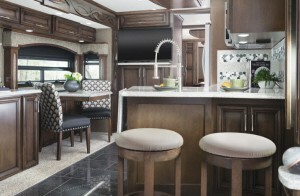 View All Newmar Ventana Class A Motorhome Floorplans! Why we recommend the Newmar Ventana class A motorhome: Tipping the scales on the heavier side of things is the Newmar Ventana whose lightest floorplan is still a massive one at 28700 lbs. 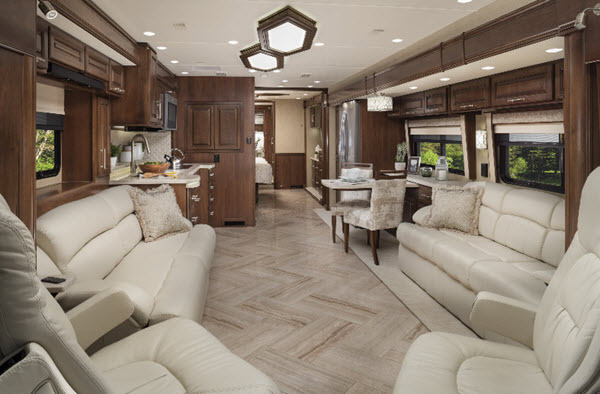 17 out of its total 18 floorplans have at least 3 slide outs such as the Ventana 3407 and the Ventana 3709, so you’re definitely all set if the sleek looks and the interior decor seems good enough to you. It does have a decent housing capacity of 7 people, and can span as much as 43 feet long, making it pretty spacious too! The Ventana has a lot to say about its features too. The interior features Bermuda glazed maple hardwood cabinets coupled with adjustable pullout pantry shelves and plush pillow top mattress. Driving is a breeze on this rig as well as the brand adds Newmar’s proprietary comfort drive™ steering and cruise control to the cockpit. On the outside, that awesome look is overlayed on top of a aluminum frame and fiberglass construction. 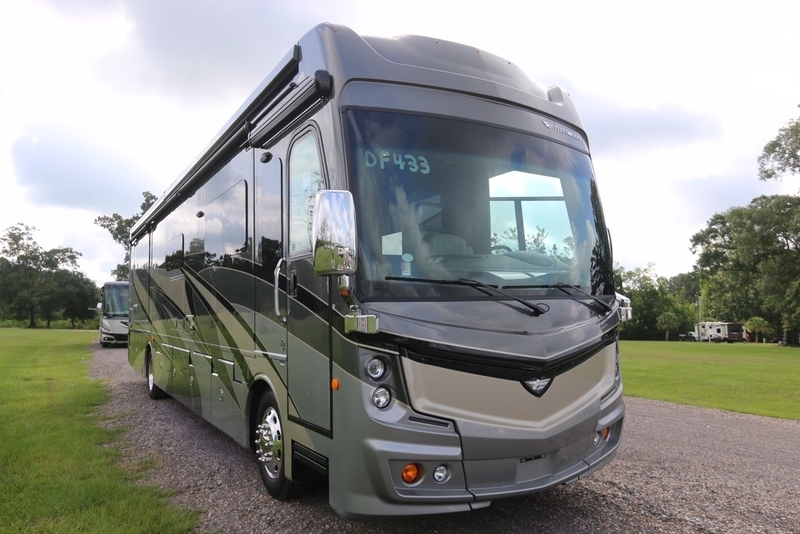 Long story short, we’ve no reason to believe that the Ventana is not one of the best class A motorhomes with slide outs in the market right now! 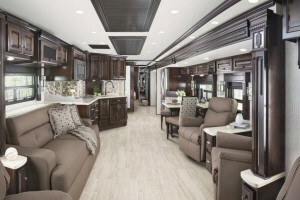 View All Tiffin Allegro Bus Class A Motorhome Floorplans! 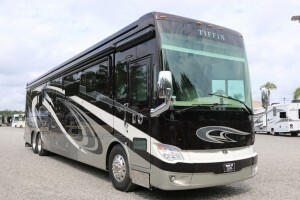 Why we recommend Tiffin Allegro Bus class A motorhome: What is considered as a ‘large’ motorhomes usually caps out between 40 and 43 feet. But the Allegro Bus by Tiffin edges beyond it with the Allegro Bus 45 OPP floorplan that is 45 feet long. 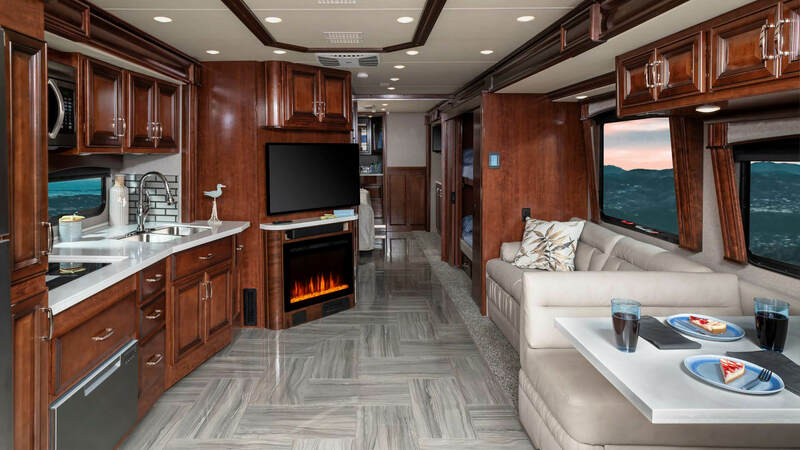 Of course, ones who aren’t all for this extreme can go for the smaller but still just as luxurious Allegro Bus 37 AP floorplan, making this camper a truly versatile one. Constructed out of fiberglass, the exterior of this RV has probably as much to say about it as the interior such as the high-performance thermal insulation thanks to the fiberglass material and the one-piece tined windshield for easier vision when driving. Heading inside to the driver’s seat you’ll notice that Tiffin has been extra cautious and added a 12V disconnect switch. 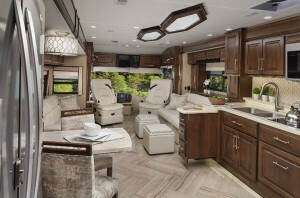 Akin to a fifth wheel and a travel trailer you also have options to make it better such as a memory foam mattress and a bedroom TV. True Class A Experience Starts Here! 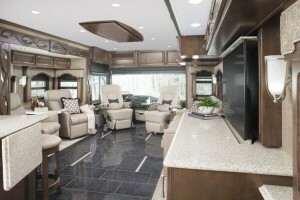 View All Entegra Aspire Class A Motorhome Floorplans! 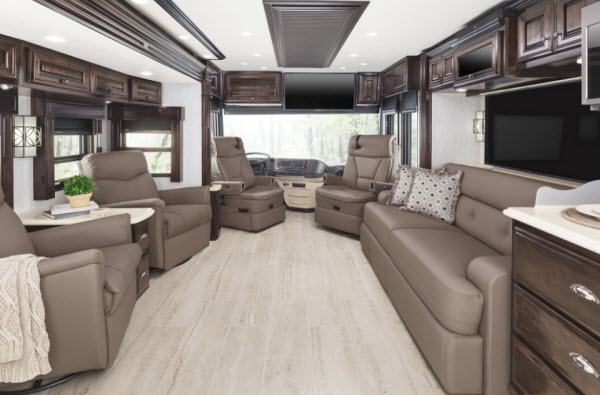 Why we recommend the Entegra Aspire class A motorhome: If you’re only looking for a brand that focuses on larger sized floorplans, then the Entegra Aspire is where it’s at. All 8 of its floorplans have at least 3 slide outs albeit with different sleeping capacities. 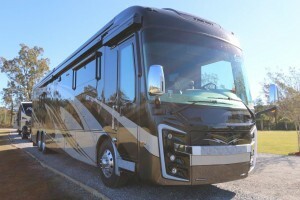 They’re between 40 and 44 feet long which is quite spacious, and thus contribute to an RV that’s one of the best class A motorhomes with slide outs. We recommend taking a look at the Aspire 38M and the Aspire 42RBQ floorplans. Onto the features, you’ll notice that these are just as impressive as the Aspire’s on-paper specs. The luxurious interior is complimented by the multiplex controlled lighting system whilst taking care of functionality when you’ll notice that it has the central vacuum system and deep drawers in the kitchens for thing such as wastebasket as well. Add expansions such as compliance with Canadian Standards and solar panels to the package, and you have a class A motorhome on your hands that provides a true class A motorhome experience. Leaves You Longing For More! 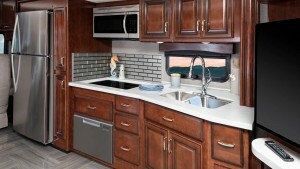 Why we recommend the Newmar Dutch Star class A motorhome: Whether its due to their cozier 37-feet Dutch Star 3717 floorplan or due to the 6-sleeper Dutch Star 4363 floorplan, campers have always recommended their Dutch Star to anyone else inquiring about them, and we don’t disagree either. Apart from the ones we mentioned, it has 13 other floorplans, all of which feature at least 3 slide outs too, providing you with quite a few options! Few class As in the market can boast their level of driving experience to be the same as the Dutch Star, and for a good reason. The comfort drive steering and the Freightliner® suspension coupled with other parts makes it possible. It’s not without its set of consumer features, either. You’ll enjoy the USB outlets at multiple places and the fireplace or upgrade the regular sofa to an 87-inch one with its number of options provided. All in all, the Dutch star is a great motorhome with slide outs! ‘Discover’ The World in Comfort! View All Fleetwood Discovery Class A Motorhome Floorplans! 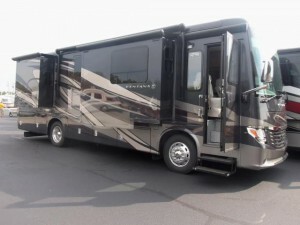 Why we recommend Fleetwood Discovery class A motorhome: Heading into the great outdoors and camping in the embrace of mother nature shouldn’t be an uncomfortable experience, and the Discovery takes care of that, but more on its features later. On paper, it has 7 floorplans which cover a decent length and weight ranges. We recommend taking a look at the Discovery 38F and the Discovery 38N. 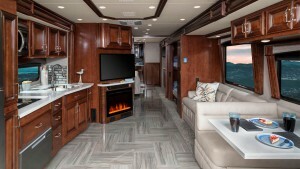 The Fleetwood has it all, from a electronic command control center to a camera system for the driver, all the bells and whistles that you’re accustomed to if you’re shifting from a different class A motorhome is all here and then some. The roof-mounted 15,000 BTU air conditioner provides enough cooling, and the expansions such as a third AC and a technology package which adds a series of useful features such as a Wi-Fi extender are an absolute treat as well! 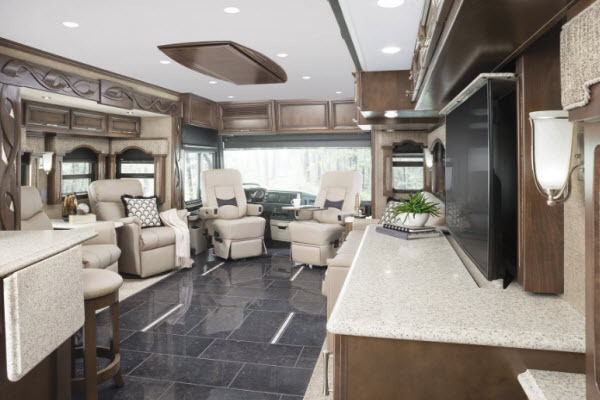 Even a 40-feet motorhome isn’t as large as your home is, making it an absolute necessity to have as many slide outs as possible to compensate for it. Hopefully this should serve as a good starting point for choosing one! 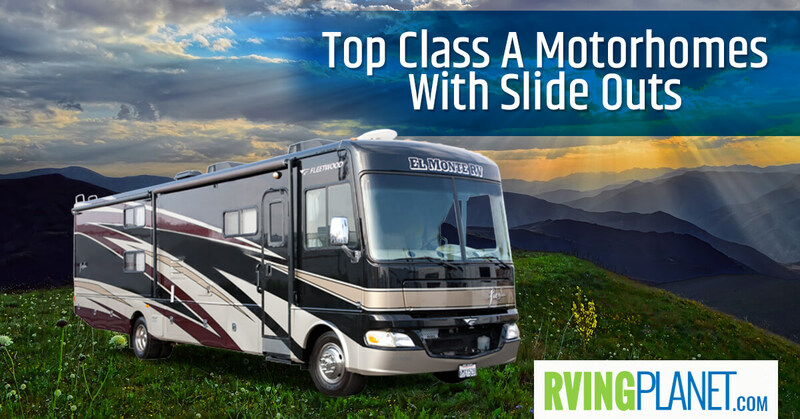 Share with us your favorite class A motorhomes with slide outs in the comments below!